The effectiveness of international humanitarian law (IHL) faces challenges from different quarters. Parties may be unwilling to acknowledge that a situation of violence amounts to an armed conflict, which therefore triggers the application of IHL. IHL relies on relatively weak enforcement mechanisms (despite the proliferation of international courts), which could limit incentives for compliance. Parties may lack the appropriate structure and resources allowing them to acknowledge, understand, and implement their obligations. These and other realities reveal the importance of implementing strategies specifically aimed at generating respect for the law. The main strategy pursued to date concentrates on engaging the parties to the conflict and ensuring that they respect their obligations under IHL. Another strategy—a complementary one, given its diffuse effects—focuses on a set of powerful societal actors that can influence the parties’ behaviours and ultimately their conduct in times of war. This post focuses on the second strategy and aims to address one specific dynamic that remains underexplored: the role of religious leaders in enhancing compliance with IHL. What makes religious leaders influential? Some religious leaders—whether priests, ministers, imams or rabbis—have over the past decades put forward interpretations of religion that advance respect for IHL or, on the contrary, that come in direct conflict with IHL rules. In so doing, these leaders have been making a claim of ‘special’ legitimacy, an aspect which shapes them as particularly influential societal actors. Religious leaders belong—as we have suggested elsewhere—to the analytical category of religious actors. This category can be empirically delineated to include those States and non-State entities that grant religion a central place in their functioning by means of adopting a religious organizational structure, religious doctrine, religious motivations, or by espousing a predominantly religious discourse. Whereas their religions, goals, and indeed the forms they take differ—and therefore we can distinguish between (individuals) religious leaders, non-State religious associations, armed groups and religious States of various denominations—what unites religious actors is a common claim that they are legitimate interpreters of religion. The underlining question is why followers, including individuals belonging to armed groups, obey religious leaders’ interpretations and why they act upon legal norms put forward or otherwise shaped by these actors? Drawing on Max Weber’s work—but adapting it according to the scope of the study—scholars have highlighted the legitimacy of the law, or of the authority enforcing the law, as the central aspect which determines compliance (see here at 27). This observation does not negate that individuals follow commands for a variety of complex reasons determined by ‘[p]ower relations as well as historical, political, social and anthropological conditions’ (see here at 4–5), and that rewards or coercion may play a role in their decision to comply with a rule. The relationship between religious leaders and their adherents can be identified as one of command-obedience between an authority and individuals, that is, between a power-holder and a power-subject. This is no different than the relationship between a secular (as in non-religious) democratic parliament and citizens. However, whereas in the latter case it is the legal-rational aspect of the law that confers legitimacy and generates compliance, in the former case, the legitimate authority of religious leaders is predominantly grounded in tradition and/or charisma. In other words, adherents will follow a specific command or rule not primarily because it has been derived in a legal-rational way and is fair, or because they participated (indirectly) through democratic processes in creating that rule, but because the religious leader is perceived to have the authority by virtue of tradition or charisma to issue the command. Leaving aside for a moment the question of whether the influence of religious leaders has improved or frustrated compliance with IHL, it is clear that over the past decades religious leaders have shaped norms and have attempted to influence the parties’ behaviours during armed conflicts or in post-conflicts scenarios. Rabbi Shlomo Goren, the first Chief Rabbi of the Israel Defense Forces (IDF), is said to be the architect of ‘the modern corpus of Jewish law and ethics relating to war and the military’ by both shaping the role of the IDF Rabbinate and issuing a number of religious rulings on military conduct. As a result of his interpretation of religion, and that of subsequent military rabbis, Cohen argues (at 389) that ‘[r]eligion does not exist as a segmented subculture within the overall Israeli military fabric. Rather, it constitutes one of the IDF’s integral components’. What has been achieved is ‘a symbiosis between religion and military service that, even if not altogether unique, is certainly more pervasive than the experienced in other modern armed forces’. 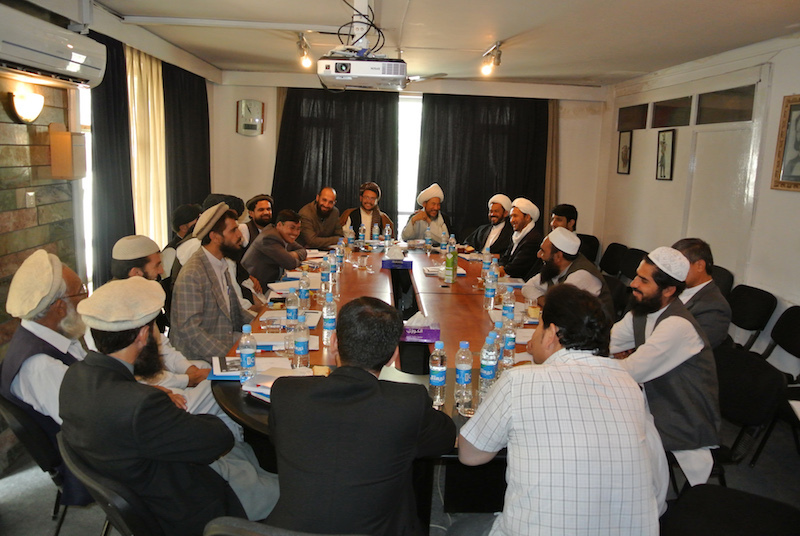 In Afghanistan, the Taliban’s code of conduct includes many references to religious obligations for its members, pointing out that they have ‘the duty to behave well with people in accordance with Islamic ethical and moral values, and should try to win hearts and minds of ordinary Muslims’ (here at 119). Furthermore, when dealing with the administration of justice, the code explains that ‘[e]ach person responsible in the province should set up a Sharia court at the provincial level, comprising one judge and two prominent theologians who will solve complicated issues at the provincial level which seem to be difficult to solve for theologians and those responsible at the district and village levels’ (here at 112). Another example can be seen in Iraq. The Grand Ayatollah Ali Sistani, one of the most important Shia Muslim clerics in Iraq, issued a statement indicating how individuals should behave when fighting against the Islamic State. Pope Francis has recently reiterated the Holy See’s support for IHL. While noting the importance of the Additional Protocols to the Geneva Conventions of 1977 and the importance which the Holy See attaches to these instruments, the Pope observed that ‘humanitarian law presents hesitations and omissions’. He encouraged combatants and humanitarian aid workers to find a place in their conscience to ‘acknowledge the moral duty to respect and protect the dignity of the human person in every circumstance, especially in those situations where it is most endangered’. This is, by all accounts, a religious leader’s attempt to enhance compliance with IHL and supplement the law’s shortcomings by appeal to moral sources. The role of religious leaders in post-conflict settings has, at times, been instrumental. Many have advocated for, participated in and influenced the functioning of transitional justice mechanisms. The crucial role played by Archbishop Desmond Tutu in the works of the South African Truth and Reconciliation Commission is emblematic and has further influenced other religious leaders. Truth-seeking and reconciliation are forms of dealing with the past often advocated for by religious leaders. At the same time, research demonstrates that accountability through criminal justice, reparations, and institutional reforms have also been embraced by religious actors in post-conflict settings. Another important finding refers to the limitations of religious entities’ engagement in transitional justice: the main limitation is provided by these entities’ accountability ‘for their own actions during the period of repression or conflict’. The ‘special’ legitimacy upon which religious leaders draw may be of specific relevance in non-international armed conflicts. Hyeran Jo has argued that some entities can play a role in ‘making or breaking’ rebel compliance. She explains that non-State armed groups which rely on sponsors that support humanitarian norms are more likely to comply with international rules (at 70). While she frames this theory around the role of the International Committee of the Red Cross (ICRC) and Geneva Call, its relevance can have wider applicability—including to the possibility of religious leaders positively influencing the parties’ behaviours during hostilities. This may be particularly relevant in conflicts where the parties themselves are religious actors—either religious States or religious non-State armed groups—and therefore more inclined to be influenced by religious leaders. When engaging with non-State armed groups in humanitarian dialogue it is generally difficult to pinpoint the incentives for complying with IHL. This is especially the case given that such groups usually were not involved in making the law (whether international or domestic) or because they regard domestic law as belonging to the opponent and thus not something that they wish to obey. Interpretations of religious leaders, however, do not draw their legitimacy from rational-legal processes, as do laws adopted by parliaments or international fora. The former are grounded in tradition or charisma and it is these sources which make them particularly relevant influencers. Religious leaders, therefore, can be messengers of universal rules, using religious texts and interpretations as a basis for the obligations of the parties. As stated by the ICRC, they can ‘raise awareness of the importance of safeguarding [humanitarian rules] and to mobilize their communities and others. They can also help enrich IHL awareness-raising events by drawing connections to religious precepts’. Taking these aspects into account, the ICRC has engaged with certain religious leaders for specific humanitarian campaigns. In Gaza, for instance, it involved imams in workshops organized together with the Ministry of Health. They ‘left with key messages and speaking points to deliver during their sermons. Engaging with Muslim leaders also led to the campaign being promoted on regular radio spots (3–4 times a day) for one week on the Al Quraan Al Kareem station’, which has hundreds of thousands of listeners (at 36). The fundamental advantage of engaging with religious leaders may appear theoretical at first, but can prove to be of great practical relevance. By highlighting that religious interpretations supporting IHL exist (or can be crafted) and that they can be relied upon to induce the parties’ compliance with the law, religious leaders, and those actors engaging with them, dispel the myth of an unavoidable conflict between religion and law. Clearly, religious interpretations can and do conflict with humanitarian norms—but engagement with these actors can highlight areas of tension and incrementally, over time, may contribute to changes in interpretation. While further research is necessary to establish the limitations of engaging with religious leaders so as to enhance compliance with IHL—including those related to their role in society, the type of conflict, the security situation, and philosophical concerns relating to the separation of law and religion—an obvious variable that must be considered when evaluating whether the involvement of such actors can result in a transfer of legitimacy is the religious leaders’ own record of compliance with IHL and their accountability. Dr Ioana Cismas is a senior lecturer at York Law School and the co-convener of the LLM in International Human Rights Law & Practice at the Centre for Applied Human Rights. Before moving to York, Ioana lectured in international law and international human rights law at Stirling Law School (2015–2017), was a scholar-in-residence at the Center for Human Rights and Global Justice at the New York University School of Law (2014) and a researcher/research fellow at the Geneva Academy of International Humanitarian Law and Human Rights (2009–2013). Over the years, Ioana has provided legal and policy advice to United Nations mechanisms, governments and non-governmental organizations. In 2013, she worked at the Office of the High Commissioner for Human Rights in Geneva and served as consultant to the UN Special Rapporteur on the promotion of truth, justice, reparation and guarantees of non-recurrence. From 2009–2012, she acted as legal advisor to a member of the UN Human Rights Council Advisory Committee. In 2017, she has been elected to the International Committee on Human Rights in Times of Emergency of the International Law Association. Yes, religious leader can positively assist in adhering to IHL rules. I am a Muslims I know so many traditions of the prophet which provide for humanitarian rules ranging from prohibition of killing women, children and the aged ones during war. Therefore Muslim leaders should encourage the application of the IHL.